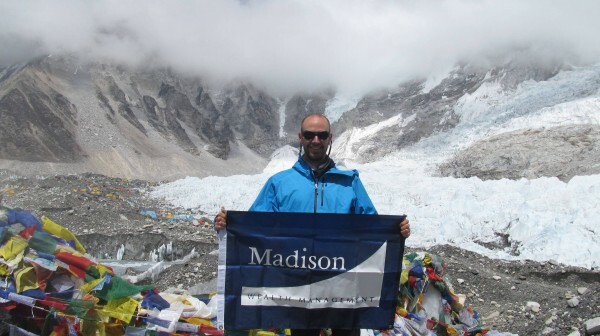 When Madison Wealth Management's Cern Basher needed a flag with his companies logo printed on it to take to the "Top of the World", yes that would be Mt. Everest in Nepal, he turned to Signco/Stylecraft to get the job done. Here is his story! Note: Madison’s Chief Investment Officer, Cern Basher, CFA recently traveled to Nepal. This Insight is his personal reflection from that adventure. I love mountains. I have been dreaming about visiting Nepal and seeing the Himalayas for decades now. I was born in New Zealand, where the Southern Alps run down the spine of the South Island for almost 300 miles. I grew up in Alberta, Canada where the Canadian Rockies stretch for 900 miles and where as a young adult I scrambled up about 50 mountains. Since then I have traveled to Switzerland, Tanzania, Japan, Argentina, and Ecuador to see and climb mountains. And yet I had never seen the Himalayas. Thus when a friend who had traveled to Nepal five times in the last 25 years presented an opportunity to join him I jumped at the chance. Mountains are personal for me. They literally and figuratively represent the personal challenges in my life. Literally - I love testing my ability to get to the top of them. Climbing mountains is all about suffering and enduring numerous challenges. They are a great test of my physical and mental abilities, often with a great scenic view at the top. For me there is nothing more rewarding. Figuratively - My son, Dane, was born with a condition that leaves him unable to walk or speak. His journey in life is like climbing a mountain that has no peak. When faced with such circumstances it’s important to find a way to enjoy the journey, and he does just that. In the past, I’ve climbed for Dane and raised money to support research for all the people with Dane’s condition. And if that wasn’t enough, my father, with whom I climbed many mountains, was continuing his five-year battle with leukemia. While he had traveled to the far edges of the world, he had never been to Nepal. I wanted to experience it for him and bring back the photos to share with him. Sadly, I didn’t get that opportunity as he passed away in March. Thus to say that this trip had some meaning to me is an understatement! 1. This year was the 60th anniversary of the first successful summit of Mt. Everest. The challenge of climbing it isn’t what it once was as there are now fixed ropes placed from bottom to top and professional Sherpa climbing guides who will expertly sheppard even a novice up and down the mountain. Believe it or not, but there were a few people who climbed Everest this year who had never climbed a mountain before! For all the critics, Everest still attracts significant interest and the lure to climb the world’s highest peak is still irresistible for many. During this year’s May climbing season a whopping 600 people reached the summit and nine died. While there, I witnessed the recovery of a climber’s body by helicopter – a reminder to all of the dangers. On a lighter note, an 80 year old Japanese man reached the summit – so there’s still hope for me should I change my mind about climbing the mountain one day! 2. I was amazed to discover how prevalent iPhones were in Nepal, as it seemed that almost every Sherpa guide that I encountered had an iPhone! The Khumbu region is probably the wealthiest area in Nepal, so I suppose this shouldn’t have been such a surprise. Many of the Sherpa guides and climbers travel around the world; I met some who work in the United States during the summer as climbing guides or cooks at restaurants. In some monasteries I was also surprised to see a few of the monks had bottles of Coca-Cola by their side as they sat and prayed. I guess even Tibetan monks need some caffeine to stay awake during long prayer sessions – I see a good marketing opportunity for Coca-Cola there! 3. Each society has different ways of taking care of their young and old. In Sherpa culture, the youngest adult son is expected to take care of his parents in the family home in their village. The oldest sons and daughters are free to make their own way in the world. I met a number of younger Sherpa who are presented with challenges by this. Their older siblings are off pursuing education and work in other countries while they must remain at home. The Sherpa’s traditional way of life is changing rapidly and without any government-provided social safety net it will be interesting to see how they address the needs of their elderly. 4. Homes in the Khumbu region are usually made mostly with stone. The stones are hand carved and the walls are 18 inches thick. The homes are hand-crafted masterpieces that should last a very long time. But they aren’t cheap – while stone is plentiful the sheer labor required to make these homes drives up the cost. I met an engineer from New Zealand who was baffled by the building materials used. The roofs are tin and no insulation or other weather proofing materials are used. There is nothing to keep the cold or condensation out. But the Sherpa are tough people – so what’s a little cold or condensation? 5. The government in Nepal appears to be dysfunctional. The country is without a constitution. The local people that I spoke to do not trust or rely on the police. They said that corruption and bribery is rampant. While the Khumbu region is clean, the city of Kathmandu is very dirty, with the most polluted rivers I have ever seen. It definitely makes me appreciate our government: by comparison, our many problems seem quite manageable!